Quartz crystal chips Bracelet, elasticated to fit most adult average sizes. 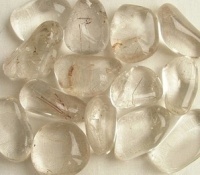 Quartz is a Universal Zodiac Birthstone. FREE UK Delivery by Royal Mail 1st Class. The Bracelets are elasticated and therefore suitable for most average adult sizes. Your Bracelet will include some information about the healing properties of Quartz, as below. It will arrive with you nicely wrapped, and in a bubble wrap envelope. QUARTZ is the most powerful healing and energy amplifier because of its unique crystalline form. It can be used for any healing condition, especially headaches, and it can deflect electro-magnetic pollution from mobile phones and computers; spiritually, it raises energy to the highest level; mentally it aids concentration and unlocks memory; it is also said to increase psychic ability. Quartz eases pain, strengthens sight, stabilises the circulation, cools burns, stops bleeding, regulates the intestine and relieves nausea. Quartz harmonises all the Chakras.